GW’s trip to the Atlantic 10 tournament was not without dramatics. The Colonials played through games with their backs against the wall, including when Fordham tied a one-run game in the bottom of the last inning of the semifinal round. Then, GW played through enough extra innings to equal an entire additional game, a feat made more impressive by senior pitcher Kara Clauss’ 14-inning complete game. And in the final inning of the A-10 championship against Massachusetts, freshman Victoria Valos smacked a two-run home run to tie the game. But in the bottom of the seventh, Massachusetts walked off with a two-out solo home run, earning a 3-2 win to end GW’s electrifying journey through the postseason. Freshman Victoria Valos connects with a pitch against UMD. Valos nailed GW’s only hit in the conference title game, a two-run home run that tied it in the seventh inning. She and Clauss, along with senior pitcher Heidi Penna, were named to the A-10 All-Tournament Team. GW first took the field in St. Louis Wednesday to slam its way to a decisive 9-2 victory over Charlotte. The Colonials relied on their speed in the game, stealing a season-high five bases, and used a four-run fourth inning to tally the first runs on the scoreboard. After the 49ers answered with two runs in the fifth, GW batted around the order in the bottom half of the inning, adding four more runs. One more in the sixth made it 9-2 and the Colonials walked away with their first victory of the tournament. The next day, GW faced Massachusetts and standout Minutewomen pitcher Sara Plourde, who stumped the Colonials earlier this season. The second contest of the A-10 tournament saw GW fall to Massachusetts 5-2. The tournament was double-elimination, meaning the Colonials needed to defeat Saint Joseph’s in their next game to advance. 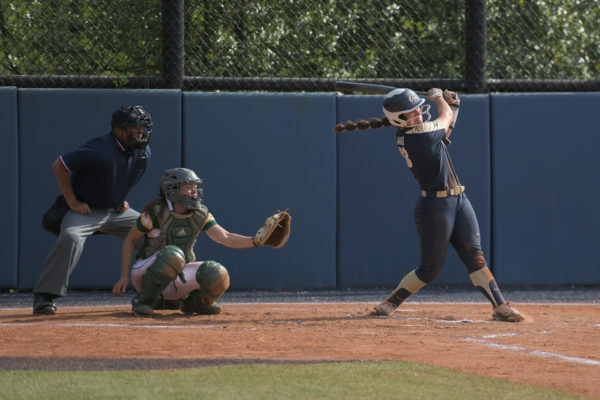 Shaking off the three-run defeat, GW began play Friday with a 1-0 victory over the Hawks, a win Schramm said was rooted in returning to the Colonials’ plan of maintaining uncomplicated play. 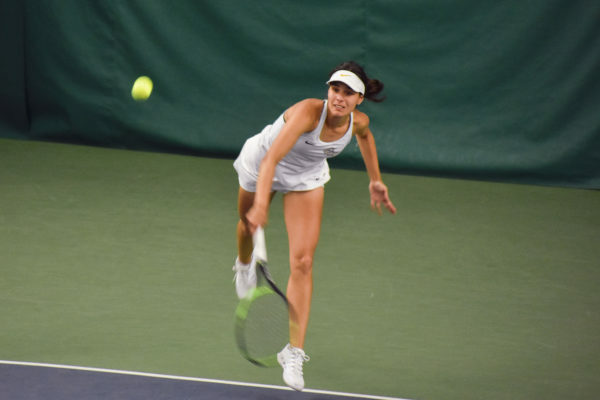 As the Colonials looked to advance to the championship, one strong opponent remained in their path: a semifinal round against defending Atlantic 10 champion Fordham. Clauss took to the mound for another standout performance from the typically strong senior, scattering 10 singles and walking only two over 14 innings. She faced 56 batters, throwing 158 pitches. The game was scoreless over the first three innings, locked into a pitcher’s duel. Then, Valos nailed a long home run over the left field fence, putting GW up by one. But Fordham was able to tie it in the bottom of the seventh, sending the contest to extra play. Clauss was playing through a strained leg muscle, Schramm said, and the rest of the team was struggling through fatigue, but GW pulled together to stay strong over the additional innings. Both teams stranded eight runners on base over the next six innings, before the Colonials earned the win in the 14th. Senior Lauren Wilson advanced on a walk, then stole second, making it to third on a wild pitch. Valos laid down a bunt, sending Wilson home to break the tie. GW added two more runs before the inning was over, earning a 4-1 victory. The win sent GW to its first A-10 championship game in program history, where it again faced formidable foe Massachusetts and standout pitcher Plourde. The Minutewomen were the top seed in the tournament, but even their seeding and previous victory over the Colonials wasn’t enough to dampen GW’s hopes. Massachusetts got off to a quick start, adding two runs over the first two frames of play, and was again paced by Plourde’s shutdown performance. She was dominant on the mound, pitching a complete game and allowing just a single hit over 25 batters, striking out 11. With her teammates unable to heat up at the plate, senior pitcher Heidi Penna remained strong on the mound for the Colonials, giving up just seven hits over 30 batters. 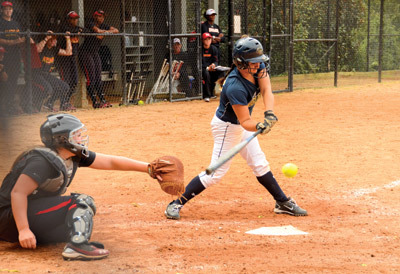 After the Minutewomen got out to a 2-0 lead, Penna held them scoreless until the seventh inning, keeping the Colonials within striking distance. And in the top of the final inning of play, Valos became the only GW player to solve Plourde on the day, lining a two-run home run down the left field line to tie the game. But the team couldn’t extend the scoring rally, stranding one on base at the end of the inning. The tie left enough room for Massachusetts to seal a victory in the bottom of the inning, tacking on a walk-off home run down the right field line to secure the A-10 title. The tournament run was GW’s first trip to the A-10 postseason since 2007, and just the second bid in program history. Additionally, the Colonials concluded their season with a 25-30 overall record, breaking the program mark for most wins in a season. GW will graduate seven seniors this year, a class Schramm became emotional discussing after Saturday’s game. She emphasized the senior Colonials’ tenacity throughout their careers, having stuck with a slumping program and worked to return GW to the top of the conference. The upcoming season will be exciting, Schramm said, but she’s already thinking about the roster holes the seniors will leave.